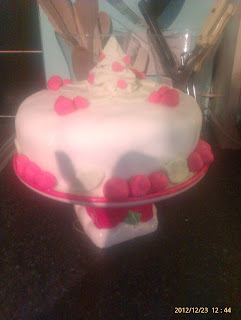 There always seems to be so much involved in making a Christmas cake these days. Full of ingredients that are, not so much hard to find, just not the sort of thing the everyday cook keeps in the kitchen. As I have written in the past, I am a big fan of cut price convenience mixed with home cooking. I won't buy a pie, but I am a fan of pre-made pastry. Especially now a lot of places have taken on the 'light' versions. They are still not strictly healthy, but a lot better than my grandma would've made 30 years ago. This also applies to my Christmas cake. My recipe is based roughly around an old Delia Smith Recipe, from he Complete Cookery Course (Link to Amazon) book first published in 1978! I have tweaked it, quite a lot if I'm honest, to make it simpler to make. I like to make this a few weeks before Christmas, the 'feed' it with Brandy. Basically that means poking holes in the cake and adding spoons of brandy to it every few days, or when you remember if you're like me! It doesn't have to be made this way though, it's a lovely rich moist cake as it is, the Brandy just makes it more traditional...........or boozy. You will need an 8" round cake tin, I prefer the loose bottomed type. Put the mixed fruit in a bowl and spoon over the Brandy, to soak. Leave for at least 12 hours, covered with a cloth. 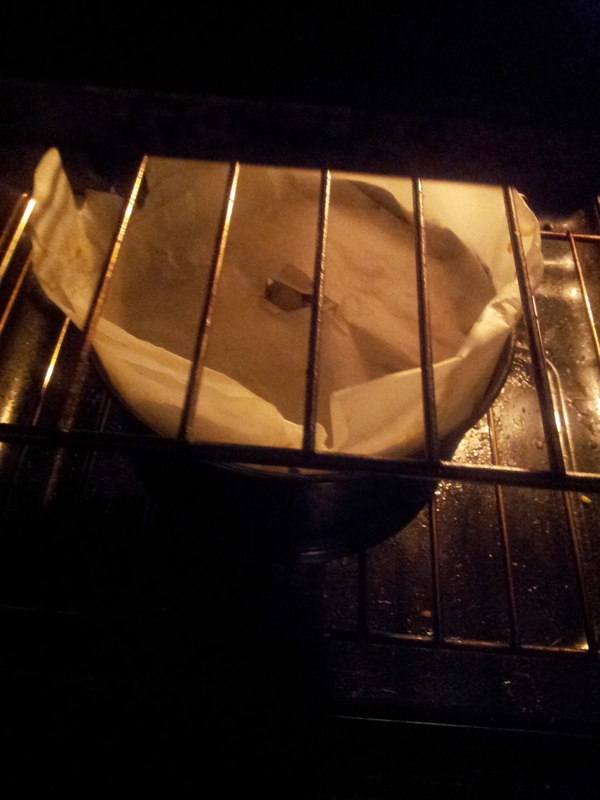 Prepare a cake tin ready, by lining the bottom and sides. I tend to double up the greaseproof paper, rather than covering the outside of the tin, as Delia recommends. Cream the butter and sugar together, until light and fluffy. Beat the eggs. Then, a spoon at a time, add them to the creamed sugar mixture, beat well with each addition. If it looks like its about to curdle (which always happens to me) add a bit of the flour. Once the egg is completely added and mixed, fold in the flour and spices (if using). Add the fruit to the mixture. 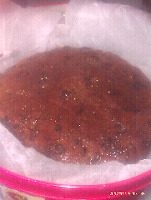 If Brandy is left in the bowl, set it aside, you can pour it on the cooked cake. Put the mixture into the prepared cake tin. Cut a round piece of greaseproof paper. Cut a hole into the middle of it, around the size of a £2 coin. Place this on top of the cake mixture, this will stop the top from burning. 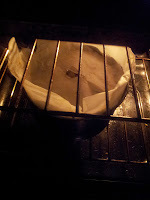 Place the cake in the centre of the oven for 41/2 to 43/4 hours, you know your oven. Delia recommends that you do not open the oven door until at least 4 hours have passed, I follow this. When it's cooked, leave to cool before you attempt to remove it, then store in an airtight container. Sorry to all my Foodie friends, this is where I cheat.......and have fun! My topping is basically, warmed apricot jam spread over the cooled cake, to work as a glue. Then roll out some ready made Marzipan, cover the cake and leave to go hard. Then spread more warmed apricot jam, and cover with rolled, ready made, Icing. Do share your pictures with me, if you make one. I love Christmas cake, but I've never tried making one. No one in my house will eat it. Yours looks beautiful!